Manchester United have been accused of acting unprofessionally following the sacking of David Moyes. BBC Sport understands Moyes is furious with the way his dismissal was handled by the Premier League champions. In a statement issued on Wednesday, he said he was proud to have managed the club and thanked Sir Alex Ferguson for giving him the chance to become boss. But the League Managers' Association (LMA) said United were guilty of behaving in an "unprofessional manner". Intense speculation surfaced on Monday afternoon that Moyes, 50, was going to be sacked, but it was not until a meeting with executive vice-chairman Ed Woodward on Tuesday morning that he discovered his fate. "The LMA is very disappointed with the nature of David's departure from Manchester United, and to read extensive reports in the press confirming David's sacking before David himself had been spoken to officially by the club," said LMA chief executive Richard Bevan. 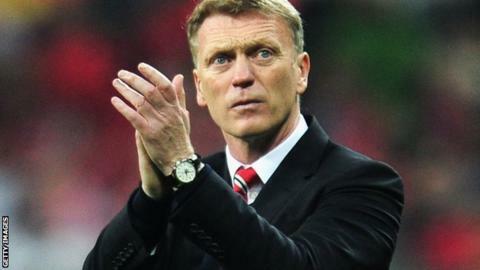 United have defended their conduct, insisting the final decision to dispense with Moyes was not taken until late on Monday evening. Club sources have confirmed Woodward instigated a telephone conversation with Moyes on Monday afternoon, during which it was agreed the pair needed to meet as a matter of urgency. The meeting was eventually arranged for Tuesday morning as conversations involving the Florida-based Glazer family, who own United, ran on until late on Monday. "We do not accept that it was handled in an unprofessional manner," said a club spokesman. In his first public statement since his dismissal, Moyes said he wished United well for the future but made no reference to the players he has left behind. "To have been appointed as manager of Manchester United was and remains something of which I will always be incredibly proud," said the Scot. "I remain grateful to Sir Alex for believing in my ability and giving me the chance to manage Manchester United." Moyes said following Ferguson, who retired in the summer of 2013 after winning 38 trophies in a 26-year reign, was always going to be a "significant challenge". Of his 10-month tenure, he added: "The scale of the manager's job at United is immense, but I have never stepped away from hard work. "The same applies to my coaching staff. I thank them for their dedication and loyalty throughout the last season." Former Everton boss Moyes admitted results and performances had not been "what Manchester United and its fans are used to or expect", adding: "I both understand and share their frustration." But he added: "I have always believed that a manager never stops learning and I know I will take invaluable experience from my time as United's manager." Tim Cahill, who played for Moyes at Everton, said his former boss would have "done everything he could for the club to win". The Australian midfielder added: "I feel for him. I know this will hurt him. "It's easy for ex-players and pundits to fire bullets, but I don't think he has had a fair crack at the whip. "It was a transitional stage that was really messy but, at the same time, had glimpses of brilliance." Following Sunday's 2-0 defeat at Everton, Moyes left with United seventh in the Premier League table and unable to qualify for next season's Champions League. Ryan Giggs, 40, has taken temporary charge of team affairs but is not in the reckoning to become the club's full-time manager. Among the early favourites to succeed Moyes are Netherlands coach Louis van Gaal and Real Madrid's Carlo Ancelotti. Ferguson, who hand-picked Moyes to succeed him, will play a key role deciding who becomes the club's next boss.